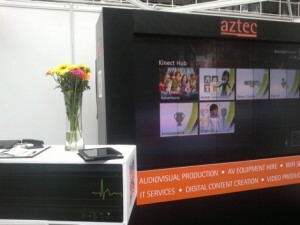 Aztec Event Services went completely interactive at this week’s Event & Exhibiting Show, 13th and 14th July at Business Design Centre, showcasing how its leading products, including Christie MicroTiles, XBox Kinect and Apple iPads, can be deployed in the events and exhibitions environment to help organisers, exhibitors and visitors to get the most from a show. On Stand E8 Aztec took display technology to the next level with Christie MicroTiles and also demonstrated their approach to using the versatile iPad, and how it can be used by organisers and exhibitors to make on-site project management a much simpler, user friendly experience. It (the iPad) also makes a significant move towards a paperless environment for the event and exhibition world. For those seeking something really lively and interactive, the new gaming sensation XBox Kinect was on show. It is ideal for less formal events and corporate entertainment. Kinect means controller-free, full body play with the console responding to your every move – and by connecting the console to large screens and interactive video walls, the possibilities for corporate fun, we are told, are endless. This entry was posted on Thursday, July 14th, 2011 at 19:30 @854 and is filed under DailyDOOH Update. You can follow any responses to this entry through the RSS 2.0 feed. You can leave a response, or trackback from your own site.